Name the Cassowary Competition – open to all, entries close 5pm Wednesday 12 December! The University of New England’s Natural History Museum has a new exhibit! A stunning southern cassowary is now on display in the museum and she is waiting expectantly for a name. Cassowaries are an endangered species found throughout the rainforests and nearby woodlands and swamps of Northern Queensland. These large flightless birds play an important role in the dispersal of rainforest plant seeds. Of three species of cassowaries in the world, only the southern cassowary, Casuarius casuarius johnsonii,is found in Australia. Like the emu and ostrich, the southern cassowary is a ratite, a large flightless bird with unusual feathers and other features that distinguish it from all other birds. A striking bird with glossy black plumage, the adult southern cassowary has a tall, brown helmet on top of its head (called a casque), a vivid blue and purple neck, long drooping red wattles and amber eyes. The purpose of the casque is unknown but it may indicate dominance and age, as it continues to grow throughout life. Recent research indicates it may also assist cassowaries in “hearing” the low vibrating sound made by other cassowaries. The casque is spongy inside, rather than bony, and may also act as a shock-absorber that protects the bird’s head when it pushes through dense thickets of rainforest and scrub. UNE’s cassowary was found near Mission Beach in Queensland after being caught in a pig trap several years ago. At that time, Dr Hamish Campbell from UNE, was undertaking a cassowary research project nearby and managed to secure a permit to have the bird transported to UNE in Armidale. Intact adult cassowaries are very difficult to obtain as the majority of deaths are caused by traffic strike and result in unfortunate disfiguring of the specimen, so although it was a fatal accident, it was a real find for UNE. The bird was placed in UNE’s Zoology freezer room and was used for modelling purposes and to answer specific scientific questions around its mechanical features. Over the ensuing years, the cassowary remained in the freezer, its future undecided. When Narelle Jarry, UNE’s Curator, Cultural and Teaching Collections, heard about the bird, she hatched a grand plan. The cassowary would make a fantastic addition to the UNE Natural History Museum! Now she needs a name! 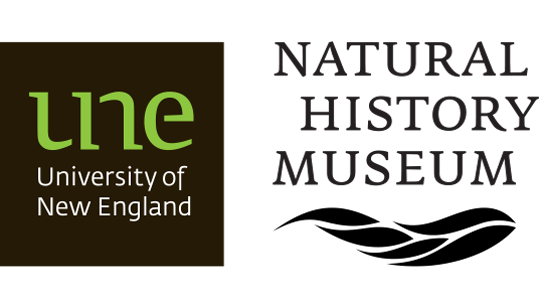 You must visit the UNE Natural History Museum to enter the competition. Entry forms are available in the UNE Natural History Museum. 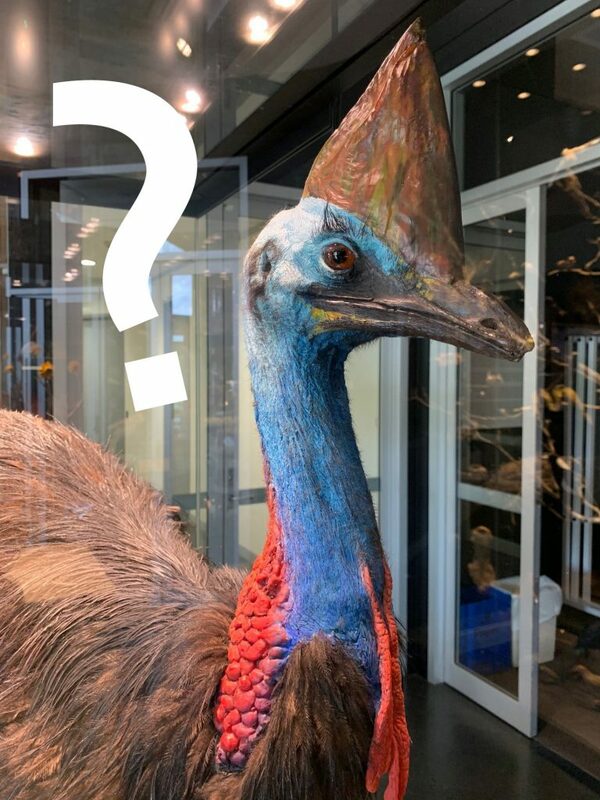 Complete the entry form with all your details and your suggestion for the cassowary’s name and drop it in the entry box located in the museum. When is the Natural History Museum open? The Natural History Museum is open from Monday – Friday 9:30am – 4:30pm. Where is the Natural History Museum located? You can drop visitors right at the door of the Museum and then park the car. There are two carparks on the road just to the west of the Museum. The closest visitor parking is in the western carpark about 200m further on from the Museum drop-off circle. There is also the carpark behind St Mark’s Church for those with a UNE permit. It’s free! There is no cost associated with entry to the museum or to submit an entry. The competition closes on Wednesday 12 December 2018. Entries must be received by 5pm on that day. 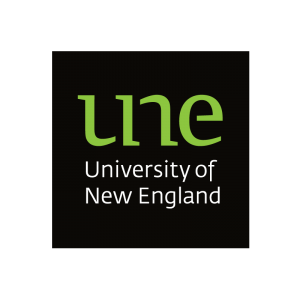 Entries will be judged by a 3-member panel consisting of three UNE representatives. There are no prizes other than the glory, satisfaction, honour and prestige of having the UNE cassowary forever known as the winning entry name. A small naming panel will appear with the cassowary. Competition enquiries can be emailed to Lee-Anne McKinnon. 1. Members of the public, community members, children, UNE staff and students are eligible to enter the “Name the Cassowary” competition. 2. Any participant who is under the age of eighteen (18) years is required to obtain their parent’s or guardian’s permission to enter and agree to these terms and will be deemed to have obtained such permission by submitting an entry. 3. People may enter multiple individual entries. A separate entry form must be completed for each suggested name. 5. There is no prize for the winning entry. 6. Participants have no claim on their entry name and will receive no commission, royalties or any financial reward for the use of their suggested name for the cassowary. 7. The decision of the judging panel is final and no correspondence or discussion regarding its decision will be entered into. By participating in the competition, participants agree to be bound by the decisions of the competition judging panel. It is a condition of entry that all rules are accepted as final and that the competitor agrees to abide by these rules. 8. The closing date for competition entries is 5:00pm on Wednesday 12 December 2018. 9. The winner will be officially announced in the UNE Discovery Newsletter December 2018 issue, expected to be finalised and distributed by Wednesday 19 December 2018. 10. The winner may be notified earlier than 14 December 2018 to facilitate media and UNE coverage of the competition. 11. UNE collects personal information such as name, mobile telephone number and email address about the entrants to enable them to participate in the competition and for the purpose of carrying out the competition. Any requests to access, update or correct information should be made to UNE. 12. Participants agree to the publishing and disclosure of their entries and personal information (for the purposes of the Privacy and Personal Information Protection Act1998 (NSW)), including but not limited to their name, image, video footage, audio recordings, written material or testimonial statements in any marketing, web, media or other publications associated with the competition or UNE in any format. 13. 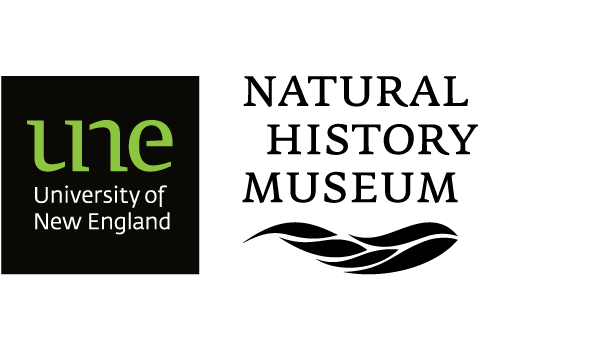 UNE will not be liable for any personal injury, loss, damage or expenses (whether direct or consequential) to persons or property arising out of or otherwise connected with this competition or entry into this competition.